Editor’s note: Sahar Aziz is an associate professor at Texas Wesleyan School of Law and a fellow at the Institute for Social Policy and Understanding. She is also a member of the Egyptian American Rule of Law Association. The views expressed are her own. 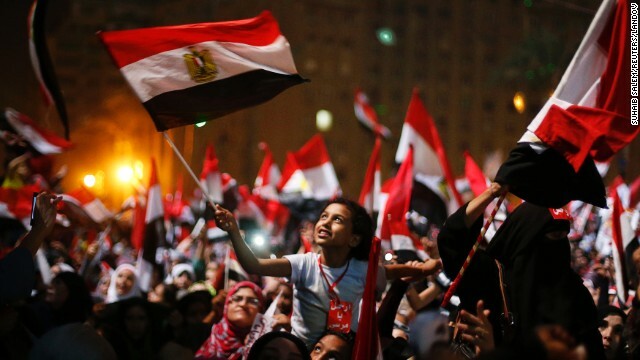 For the millions of Egyptians that swarmed into Tahrir Square on June 30, their point was not merely to show their displeasure with the Morsi regime’s abysmal performance and its adoption of Mubarak-style authoritarian tactics. Rather, it was a resounding rejection of what they perceived as a grave transformation in the identity of the state. While Egyptians are approximately 90 percent Muslim and ten percent Coptic Christians, of whom a vast majority are devout, most are still content with the secular nature of their government. They take seriously the Islamic proverb that there is no compulsion in religion, and object to the coercive Saudi Arabian model. Thus, many Muslims and Copts alike have been alarmed by developments in recent months that they saw as altering Egypt’s very identity. By the end of Morsi’s first year in office, he and his Muslim Brotherhood backers were perceived, rightly or wrongly, as imposing an agenda based on an international religious and political ideology inconsistent with Egypt’s national interests. Not only was Egypt’s foreign policy in the region shifting towards Islamist parties and regimes, but domestic policy in education and culture was also shifting away from secularism. For example, Morsi’s foreign policy became more sympathetic to Hamas – the Palestinian Muslim Brotherhood – and less consistent with the Egyptian military’s long standing zero tolerance of alleged Islamist extremists operating in Sinai. As a result, Egyptian military casualties and kidnappings were increasing at an alarming rate, prompting some Egyptians to question their new president’s vision for the country. Even more troubling for Egyptians was a conference held by the Muslim Brotherhood a few weeks before Morsi’s ouster, during which Egyptians were encouraged to lead a holy war in Syria. Morsi’s silence when hardline clerics called for Egyptians to become martyrs in the Syrian civil war was interpreted as the president’s consent to such views. But the Brotherhood’s overreach pre-dated the conference. Months earlier, the Education Ministry altered textbooks to remove women’s rights pioneers, such as Doriya Shafiq, who did not wear the headscarf. Elementary school books, meanwhile, were amended to include more references to religion. And Bahai children were reportedly prohibited from attending school because the 2012 constitution, drafted by an Islamist-dominated constituent assembly, only recognizes three Abrahamic faiths. (Other constitutional articles also left the door open for a regression on women’s rights under the guise of protecting the Egyptian family). In the cultural realm, where Egypt prides itself as the region’s leader, the new culture minister reportedly fired the heads of the Cairo Opera House, the Fine Arts Sector, and the Egyptian General Book Authority, a move seen as a likely precursor to censorship of any work lacking a “proper” Islamic orientation. The induction of Muslim Brotherhood loyalists into the ministry spread fears that Morsi was looking to continue Mubarak-era censorship over cultural works based not only on political ideology but also religion. It’s possible the firings were, as Morsi claimed, about rampant corruption within the Culture Ministry. Yet taken with the government’s other steps, the dismissals were seen as a further blow to Egypt’s secular identity. And in a country where accurate information is in short supply, perception matters as much as reality. Ultimately, Morsi’s regime was perceived by large swathes of the public as exploiting the populist demand for revolutionary reform to further a broader agenda to transform Egypt from a secular to an Islamic state. It should therefore come as no surprise that the military’s narrative that it has rescued Egypt from losing its very identity has been resonating. Whatever comes of Egypt’s latest political crisis, one thing should by now be clear – much of Egypt’s devoutly Muslim and Coptic Christian population were not nearly as convinced as their former president about the virtues of a religious state. All these 'evidences' are mere conjectures and assumption and based on the one demonstration by 'millions' on June 30th – conveniently ignoring the tens of millions who voted for muslim brotherhood in six elections since mubaraks departure. so called liberals cannot have it both ways – calling for democracy only when it suits them. Yes sure bro, our all puppets are saving nations in Saudi Arabia, Egypt, Jordon and everywhere in the form of dictators.Democracy for us and dictatorship for them. What a double standard! Support another bloody dictator but don't blame Muslims for another 9/11. Have stopped listening to cnn recently because of it's biased reporting towards the Islamists policies in Egypt. Was really surprised to see a report that is true and not politicized . Hope that cnn would start now restore some of its credibility . I think the pro democracy NGO's in Egypt learned a big lesson in their support for helping the Muslim Brotherhood seize power. It's that democracy doesn't equal morality. If a nation isn't ready for democracy you can't push it upon them. Democracy is advanced citizenship. It requires a strong middle class and social programs to help the poor. Egypt didn't have that. The big question now is what type of government will we see come to power? Will Sisi follow the PanArab example of Gamal Nasser? Will democratic elections force another populist uprising that puts another Islamic organization that, like the Muslim Brotherhood, is not ready to govern? Only time will tell. With our help from one dictatoship to another dictatorship.Long live uncle Sam. Egypt will be fine with the UK and Russia and the good old America of Roosevelt and no evil EU regime. Egyptians want to get their railways working and get rid of the NAZI German cars that are infesting Cairo. Time to put Germany back in the box. Egypt is done my friends! There will be no peace or democracy (especially if one is looking for a western-style!) in Egypt for a long long time. A simple explanation – Egypt's liberals and MB supporters stand each other so there will be no true election/democracy to ever occurring in the country! So the only option for Egypt is to live happily after with army-run Egypt! Hey there! Do ʏou know if they make any plugins to assist with Search Engine Optimization? I see you are discussing useful content on your website. I also have a blog to. Is not such as the one you have. Is about free keys in Horde of Heroes . I think the dynamics of the Egyptian family and persona nationally is undefinable by a westerner? This may be a misconception, however, Egyptians know this best. The family dynamic is strong.